← Turkey Talk: Need Help With Your Turkey?? As a vegetarian, Thanksgiving isn’t near the top of my favorite holidays. Heck, it probably doesn’t even make the top 5. Don’t get me wrong, I love getting together with family and friends, and focusing on all of the things we have to be thankful for, it’s just that food is a big part of any celebration for me, and some of the traditional Thanksgiving dishes leave me feeling a bit…meh. Thankfully (ha) I love to cook, so I just always make sure to create additional dishes that I’m excited about eating, whether it’s a pile of roasted vegetables or a savory mushroom pie. Of course, like every other family we always have boatloads of leftovers, and how many tofurky sandwiches can you really eat? One thing I like to do is stuff portobello mushrooms with whatever leftovers strike your fancy. Stuffing, roasted veggies, tofurky (or turkey if that’s how you roll), cheese chunks, green bean casserole, really pretty much anything from your Thanksgiving feast would be good – just maybe not the leftover pumpkin pie. Clean your mushroom caps, fill them with your desired leftovers and pop them in the oven at about 350 degrees for about 25 minutes or until your mushrooms look deliciously done. 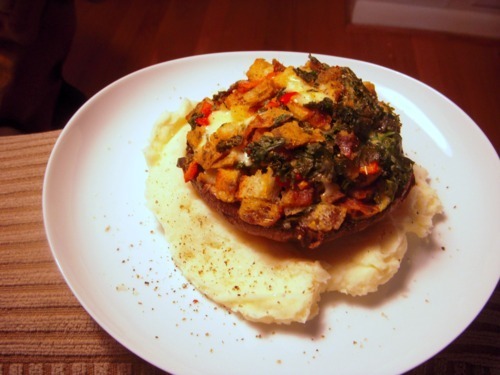 Serve on some leftover mashed potatoes, mashed sweet potatoes, or even a little bed of greens and enjoy. This entry was posted in In the Kitchen (recipes & more) and tagged farmer's market, lindsay jean hard, local food, mushrooms, Real Time Farms, stuffing, thanksgiving. Bookmark the permalink.